Some mornings getting up does not come easy. Today we woke up on a soft, comfortable dirt next to a singing stream, and the temperature was just perfect inside the sleeping bag. I had hard time pulling the valve on my sleeping pad. I listened to the hissing sound of the pad deflating but I did not move until the pad completely lost its comfort. We could not procrastinate. We had couple hours of cooler air, if we were lucky, and then the temperature would start raising, possibly as high as mid 90’s. And even though we only had 16 miles ahead of us and 2,300 feet to gain, easy day compared to the stats we were hiking recently, the heat could throw a curveball into our progress. Morning miles went well. The terrain was mostly flat. 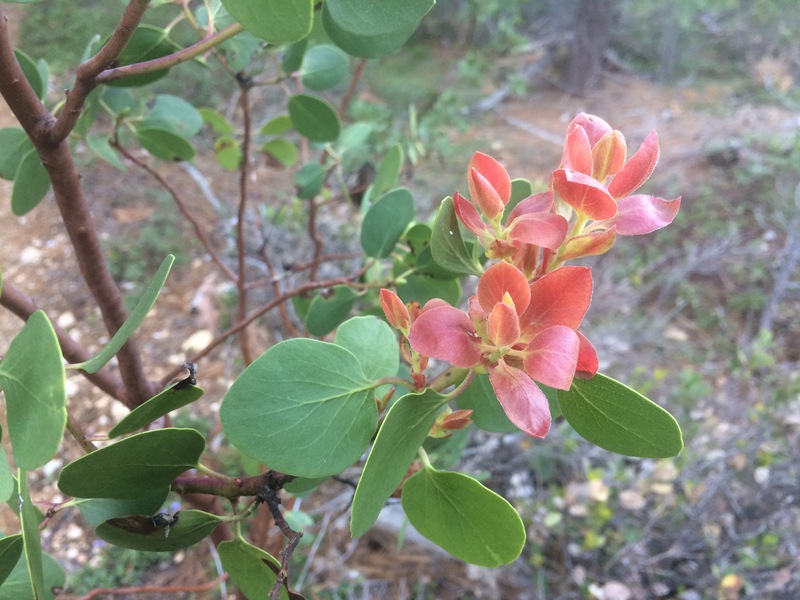 It took us through a opening full of shrub, the intriguing madrona-like bush we saw in Southern California was dominant in the area. Later we walked into a mature forest. 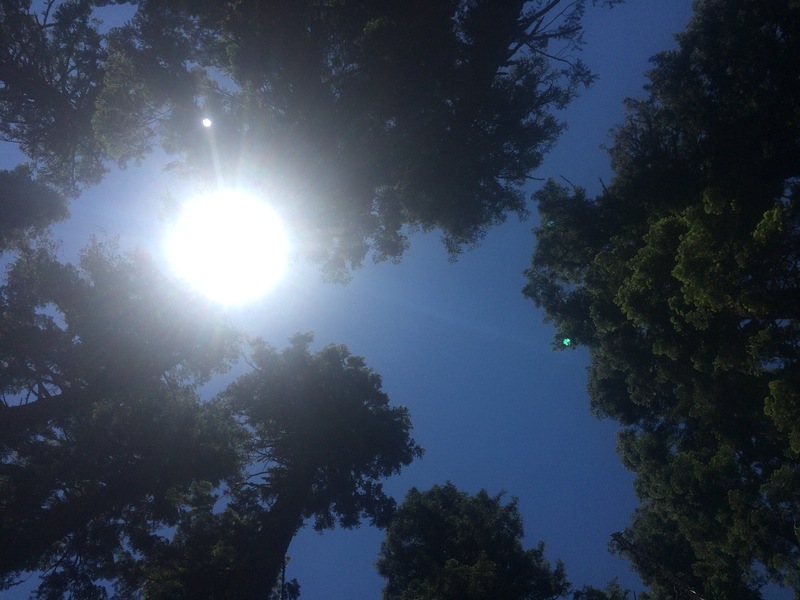 Usually forest walk don’t appeal to me as much as ridge runs offering views but today the trees kept the sun off our skin and I was thankful for that. We made 6 miles in 2 hours. At the end of the stretch there was a river and a shade for snack break. Several other hikers gathered here, including Dennis, the guy we met on Chester bus yesterday and we exchanged few words before it was time to hit the trail again. This time the trail started its climb. We were on the uphill for an hour and half and even afterwards the grade alternated between short downs and steeper ups. 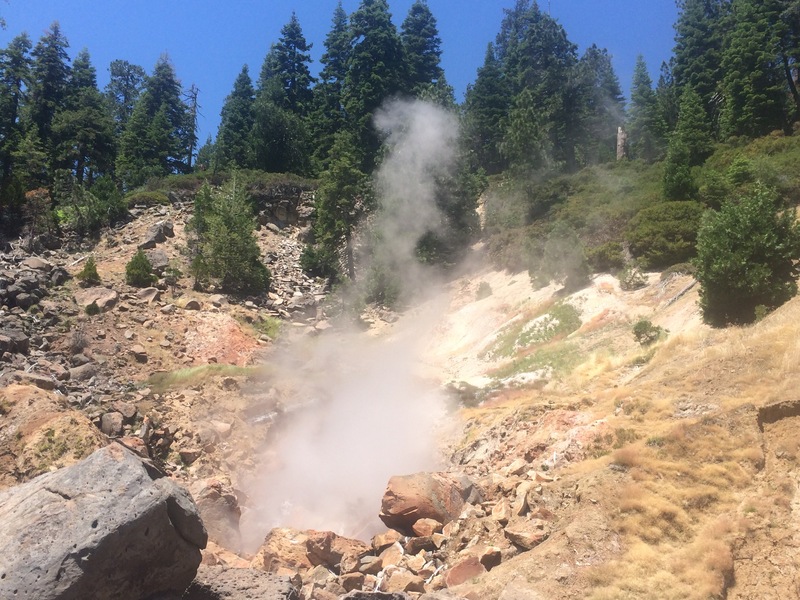 We entered Lassen Volcanic National Park in the early afternoon and soon afterwards we arrived at an intersection with Terminal Geyser which is a steaming fumarole. 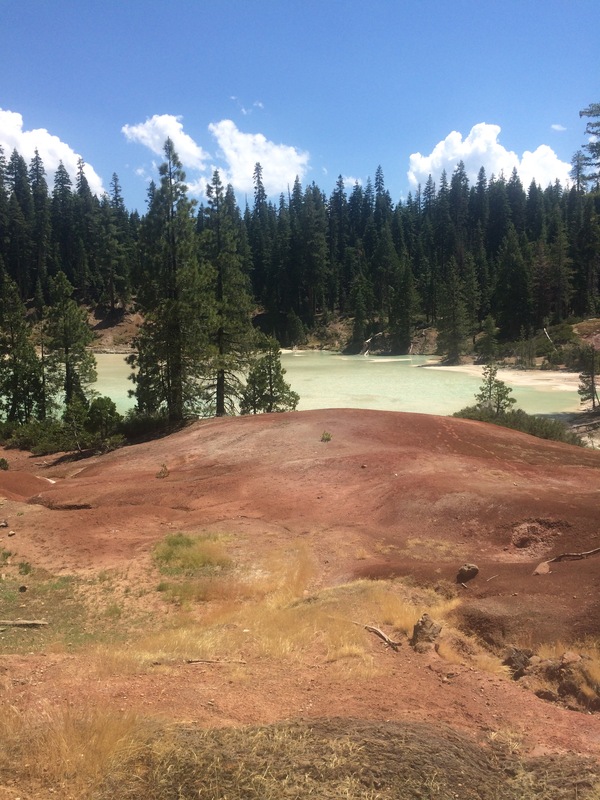 The Geyser was only 0.3 miles off the trail, so we decided to check it out. It was a near sight. The steam blew constantly from the opening and we could really tell the increase in temperature. Even the water flowing from the area was steaming hot and I took extra caution not to slip in. We talked about the snow we will encounter tomorrow on our way up back to the trail when I heard a sound similar to a pole hitting the ground. I looked up expecting fellow hikers. Instead I was staring at a big bear who was busy gnawing at a fallen tree trunk. He did not move much when he noticed us. At first he didn’t move at all but when we made more noise, he took few steps behind the log he was gnawing at and watched us. We made more noise still and finally we got enough space to move through. The bear watched us make a switchback and then he went back to his dinner. We saw more wildlife later on when we finally reached Drakesbad, hiker friendly ranch near the trail where we stopped at the end of our day to get sodas. 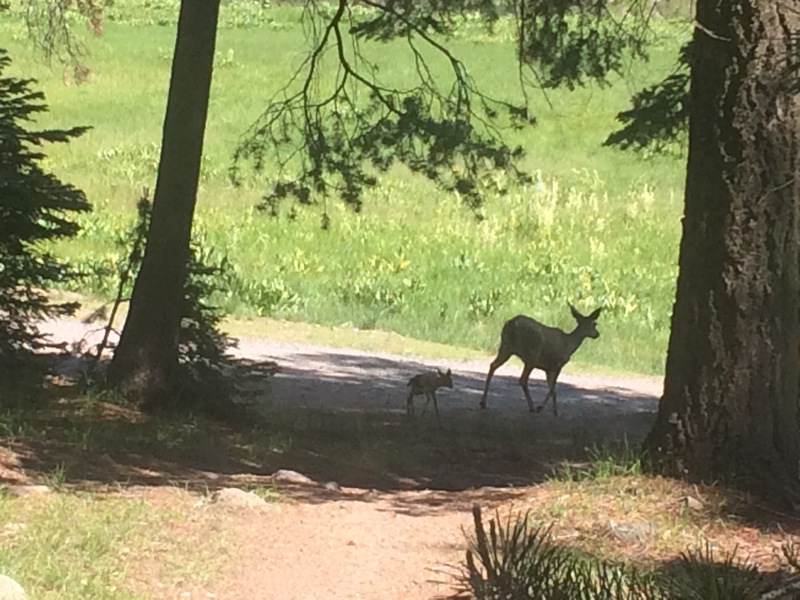 Squirrels were plentiful and very nosy, chipmunk came to check us up too and the cutest was a tiny fawn following his mother across the forest. It was the tiniest fawn I have ever seen, cute in its coat of white dots. Smallest deer I’ve ever seen. Camp filled quickly tonight. 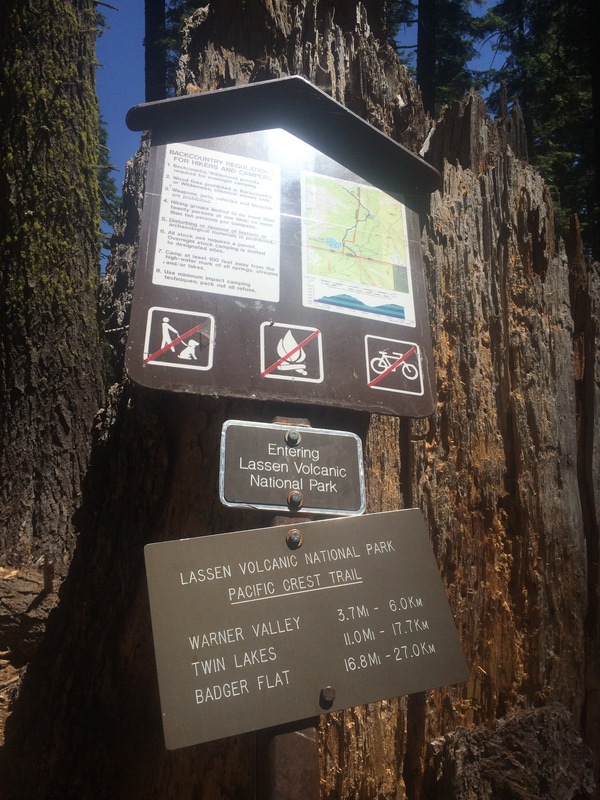 Between car campers and PCT hikers for whom this is the first and the last place within Lassen Volcanic National Park where bear canisters are not required for overnight stay as large metal boxes are provided at each site, the place was packed. 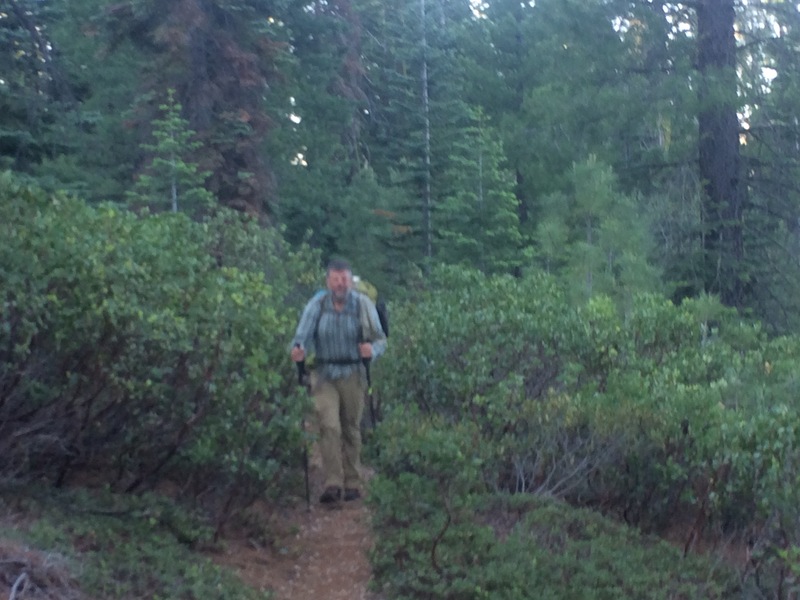 Tomorrow we have to hike at least 16 miles which would take us at the park’s boundary and even more miles to good sites where bear canisters are no longer a requirement. And from what we heard from few Sobo’s we met today, we will have to deal with snow and river crossings. It’s going to be an interesting day.